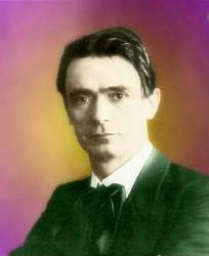 In this series of lectures, Rudolf Steiner starts back at the beginning and explains anthroposophy to his audience and via transcription to us. On Page 68, he says, " I have referred to these things before, but it is my present intention to give a resume of what has been developed within our society in the course of twenty-one years. " On Page 82, he relates that, to his spiritual way of perceiving, "the past is continually present; the present moment is, at the same time, a real eternity. "(1) Steiner suggests, in effect, that we can learn to see eternity in the present moment. If the past is continually present, then the earlier forms of consciousness are available to us right now. We had to lose those instinctive forms of early spiritual consciousness in order to develop our intellect, and now it’s time to combine spiritual consciousness with our modern intellect. [page 82] What I am explaining to you was once the content of instinctive forms of consciousness. If we really understand ancient records we find a consciousness of this fourfold composition of man and his connection with the cosmos. But this knowledge has been lost to man for many centuries; otherwise he could not have developed the intellect he has today. But we have now reached the point in human evolution when we must again advance from the physical to the spiritual. In the Editor's Preface, Owen Barfield sees this book as a book of travel rather than the guide book that Theosophy provides. [page 9] It is no longer simply the objective facts and events, but the way in which the soul tentatively begins to experience these, which the lecturer makes such earnest efforts to convey. We have exchanged a guide book for a book of travel. The one who has been there re-creates his experience for the benefit of those who have not, trying with every device at his disposal to reveal what it actually felt like. Barfield tells us that Steiner strived to bring esoteric or hidden knowledge into the light of day and make it into public knowledge available to everyone. His goal was to communicate this esoteric knowledge in an exoteric way to each one of us alive today, some eighty years after these lectures. [page 12] Is this an esoteric or an exoteric work? Certainly it will be more readily appreciated by readers who have worked through other approaches to be found in the books and lecture-cycles and perhaps especially in the Leading Thoughts. Yet it is the whole aim and character of Spiritual Science, as Rudolf Steiner developed it, to endeavor to be esoteric in an exoteric way. For that was what he believed the crisis of the twentieth century demands. And I doubt if he ever struggled harder to combine the two qualities than in these nine lectures given at the end of his life. Thus, although he was addressing members of the Anthroposophical Society, I believe that he had his gaze fixed on Western man in general, and I hope that an increasing number of those who are as yet unacquainted with any of his teaching may find in this book (and it can only be done by intensive application) a convincing proof of the immense fund of wisdom, insight and knowledge from which these teachings spring. If we possess traces of instinctive consciousness, how might it show itself? Perhaps by some feeling in our heart that we do not belong to the world, but rather we spring from something other than the physical world we perceive around us. [page 17] Thus man is confronted by the world he sees, senses and studies, and about which he constructs his science. It provides him with the basis for his artistic activities and the grounds for his religious worship. It confronts him; and he stands on the earth, feeling in the depths of his soul: I do not belong to this world; there must be another from whose magic womb I have sprung in my present form. To what world do I belong? This sounds in men's hearts today. It is a comprehensive question; and if men are not satisfied with what the sciences give them, it is because this question is there and the sciences are far from touching it. Where is the world to which man really belongs? — for it is not the visible world. One of the effects of nutrients which Steiner brought home to me was that the food we eat must be completely destroyed or changed in its form before it becomes part of our body. The process of digestion of the material we eat begins with saliva in the mouth, proceeds in the stomach and intestines aided by other organs, and is finally brought into a form which can be absorbed as nutrients in our body. Anything which cannot undergo this transformation is either a poison or a waste product. To understand how life-giving food is transformed in our living body, one need only contemplate what would become of food we had eaten if we died immediately upon eating it — it would simply decompose as our body does likewise. We are beings who can convert into living flesh the natural products of our environment which would die if left alone. [page 17, 18] Every bit of food I put into my mouth, every sip of water comes from the visible world to which I do not belong at all. I cannot live without this world; and yet, if I have just eaten a morsel of some substance (which must, of course be part of the visible world) and pass immediately afterwards through the gate of death, this morsel becomes at once part of the destructive forces of the visible world. It does not do so within me while I live; hence my own being must be preserving it therefrom. Yet my own being is nowhere to be found outside, in the visible world. What, then, do I do with the morsel of food, the drink of water, I take into my mouth? Who am I who receive the substances of Nature and transform them? Who am I? . . . When I enter into relationship with the visible world I not only walk in darkness, I act in the dark without knowing who is acting, or who the being is that I designate as myself. I surrender to the visible world, yet I do not belong to it. If we do not belong to the visible world, where is the world to which we belong? Where are we to find it? If we only believe our eyes, and this other world is not visible, what are we to believe? If this non-visible world exists, then where is it? These questions puzzled me and I walked in darkness until I found answers to these questions in Steiner's works. Like Nasruddin who had lost his key in his house, but was searching for his lost key outside under a lamp "because there was more light", I had been looking for answers where there was light, but not where I had lost the answer which was within myself. Most human beings of this world are still looking out there for answers which they had lost within. So, like Nasruddin, they are destined to crawl around on the ground under the only light they can find and search in the one place they will never find that for which they seek. [page 18] All this lifts man out of the visible world, letting him appear to himself as a member of a quite different one. But the great riddle, the anxious doubt confronts him: where is the world to which I belong? The more human civilization has advanced and men have learnt to think intensively, the more anxiously have they felt this question. It is deep-seated in men's hearts today, and divides the civilized world into two classes. There are those who repress this question, smother it, do not bring it to clarity within them. But they suffer from it nevertheless, as from a terrible longing to solve this riddle of man. Others deaden themselves in face of this question, doping themselves with all sorts of things in outer life. But in so deadening themselves they kill within them the secure feeling of their own being. Emptiness comes over their souls. This feeling of emptiness is present in the subconsciousness of countless human beings today. In the visible-to-our-eyes world, we harvest only the surfaces of things, and yet, when we do that with our own bodies, we know that what we see in the mirror hides a deep reality which we sense within. We know that the surface and flesh of our bodies will one day decompose and return to the body of the Earth and that what we really are within is not visible. In The Little Prince, Antoine de Saint-Exupéry tells us the Fox's Secret, "It is only with the heart that we see rightly that what is essential is invisible to the eye." We are like the waves appearing and disappearing on the surface of the ocean, hiding what animates them into existence. [page 21] So it is with the soul life of man. Images, thoughts, feelings and impulses of will surge up; waves everywhere. One of the waves emerges in a thought, in a feeling, in an act of volition. The ego is within, but concealed by the thoughts, or feelings, or impulses of will, as the water conceals what is living in the wave. At the place where man can only say: "There my own self surges up," he is confronted by mere semblance; he does not know what he himself is. His true being is certainly there and is inwardly felt and experienced, but this 'semblance' in the soul conceals it, as the water of the wave the unknown living thing from the depths of the sea. Man feels his own true being hidden by the unreal images of his own soul. Moreover, it is as if he wanted continually to hold fast to his own existence, as if he would lay hold of it at some point, for he knows it is there. Yet, at the very moment when he would grasp it, it eludes him. Man is not able, within the fluctuating life of his soul, to grasp the real being he knows himself to be. And when he discovers that this surging, unreal life of his soul has something to do with that other world presented by nature, he is more than ever perplexed. The human soul exists, but Nature can only approach this human soul by becoming mere semblance. Steiner subsequently provides ample answers for these puzzles through his exoteric science of esoteric knowledge, anthroposophy. He provides answers to the longing and questioning human heart which, though it loves Nature, cannot find its true home inside Nature. Steiner speaks openly and exoterically of knowledge which had been centuries earlier shared only privately and esoterically. [page 24, 25] Anthroposophy comes forward as such knowledge, and would speak about the world and man so that such knowledge may arise again — knowledge that can be understood by modern consciousness, as ancient science, art and religion were understood by ancient consciousness. Anthroposophy receives its mighty task from the voice of the human heart itself, and is no more than what humanity is longing for today. Because of this, Anthroposophy will have to live. It answers to what man most fervidly longs for, both for his outer and inner life. "Can there be such a world-conception today?" one may ask. [Anthroposophy] has to supply the answer. It must find the way to let the hearts of men speak from out of their deepest longings; then they will experience the deepest longing for the answers. Steiner begins Lecture 2 by explaining how anyone can discern the difference between the world and the human being. The world destroys the physical body of the human being after the process what we call death, which is actually the passing of the human being through the gates of death into the spiritual world. Without the presence of the human being in it, the physical body, which is made up of the materials of Nature, will be destroyed by Nature. [page 26] Yesterday I had to show how we can observe ourselves in two ways, and how the riddle of the world and of man confronts us from both directions. If we look once more at what we found yesterday, we see, on the one hand, the human physical body, perceived — at first — in the same way as the external, physical world. We call it the physical body because it stands before our physical senses just as the external, physical world. At the same time, however, we must call to mind the great difference between the two. Indeed, yesterday we had to recognize this great difference from the fact that man, on passing through the gate of death, must surrender his physical body to the elements of the external, physical world; and these destroy it. The action of external Nature upon the human physical body is destructive, not constructive. So we must look quite outside the physical world for what gives the human physical body its shape between birth (or conception) and death. We must speak, to begin with, of another world which builds up this human body that external, physical Nature can only destroy. The beginning and ending of our human physical body is in the physical world. But something happens within the human body that is not of the physical world. Steiner gives us the example of blood as something that cannot be investigated external to the human body. We know that doctors today can route blood out of the human body and back inside it during open heart surgery, and they can extract blood and infuse it into another human body. But the mystery of what the blood does once inside a particular human body remains. Doctors use abstract concepts drawn from the examination of blood on a slide under a microscope to say that they understand what that blood did when it was living inside a human body. 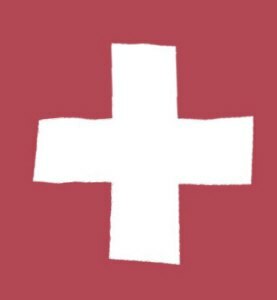 But they use a gross materialistic simplification, and while it might be practical for certain medical procedures, it tells us nothing about the living blood inside a living human being. [page 27] So we are compelled to say: Whatever the inner processes going on in the human body may be, their beginning and end are related to the external, physical world. Materialistic science, however, draws from this fact a conclusion that cannot be drawn at all. Though we see how man, through eating, drinking and breathing, takes in substances from the external physical world and gives these same substances back again, in expiration, in excretion or at death, we can only say that we have here to do with a beginning and an end. We have not determined the intermediary processes within the physical body. We speak so glibly of the blood man bears within him; but has anyone ever investigated the blood within the living human organism itself? This cannot be done with physical means at all. We have no right to draw the materialistic conclusion that what enters the body and leaves it again was also within it. Anyone who studies Steiner for very long inevitably comes to understand that the human being is a microcosm of the macrocosm. It means that each human has undergone the whole process of evolution that the Earth has undergone during its evolution, and in daily life, does the same. On a microcosmic scale, each time one eats something, digests it, incorporates its nutritive portion into one's body, and excretes the waste portion, one recapitulates an action that the Earth itself has done on a macrocosmic scale. [page 28] If you think this over you will say to yourself: There, outside, are the substances of the different kingdoms of Nature. They not always been as they are. Even physical science admits that past conditions of the earth were very different from those of today. What we see around us in the kingdoms of Nature has only gradually become what it is. And when we look at man's physical body we see it destroys — or transforms — what it takes in. (We shall see that it really destroys, but for the moment we will say "transforms".) At any rate, what is taken in must be reduced to a certain condition from which it can be led back again to present physical Nature. In other words: If you think of a beginning somewhere in the human organism, where the substances begin to develop in the direction of excretions, and then think of the earth, you are led to trace it back to a similar condition in which it once was. You have to say: At some past time the whole earth must have been in the condition in which something within man is today; and in the short space of time during which something incorporated into the human organism is transformed into excretory products, the inner processes of the organism recapitulate what the earth itself has accomplished in the course of long ages. [page 31] I now look again at man, and the very same impression that the primeval condition of the earth made upon me, is now made by the "second human being" man carries within him. Further: the very same impression is made upon me when I behold, not stones, but plants. Thus I am led to speak, with some justification, of an "etheric body" as well as the physical. Once the earth was ether; out of this ether it has become what it is today in its inorganic, lifeless constituents. The plants, however, still bear within them the former primeval condition of the earth. And I myself bear within me, as a second man, the human "etheric body". Here we have witnessed, in short, Steiner developing the concept of the etheric body of the human being, the second of its four basic constituent parts: physical, etheric, astral, and I (Ego) of the human during Earth evolution. The etheric body we find in us, waking and sleeping, involved as it is in digesting or transforming our food, but there is a "third-man" which is involved with us only during our waking states, our astral body. We can understand from Steiner’s presentation of this how it is that the etheric body remains, but the astral body leaves during sleep. [page 32] But now something further is revealed. We see the minerals free from ether, and the plants endowed with it. At the same time, however, we learn to see ether everywhere. It is still there today, filling cosmic space. In the external, mineral kingdom alone it plays no part; still, it is everywhere. When I simply lift this piece of chalk, I observe all sorts of things happening in the ether. Indeed, lifting a piece of chalk is a complicated process. My hand develops a certain force, but this force is only present in me in the waking state, not when I am asleep. If I follow what the ether does in transmuting food-stuffs, I find this going on during both waking and sleeping states. One might doubt this in the case of man, if one were superficial, but not in the case of snakes; they sleep in order to digest. But what takes place through my raising an arm can only take place in the waking state. The etheric body gives no help here. Nevertheless if I only lift the chalk I must overcome etheric forces — I must work upon the ether. My own etheric body cannot do this. I must bear within me a "third man" who can. Now this third man who can move, who can lift things, including his own limbs is not to be found — to begin with — in anything similar in external Nature. Nevertheless external Nature, which is everywhere permeated by ether, enters into relation with this "force-man" — let us call him — into whom man himself pours the force of his will. Material scientists are likened by Steiner to someone who opens a good book and studies the shapes of the letters, unable to extract the meaning which is contained in the book, in other words, someone who examines the content of the book instead of reading it for meaning. A biologist who examines Nature this way is like the butterfly collector who studies butterflies by pinning them on a wallboard for examination. Are the puzzles of living organisms made truly less puzzling by scientists who examine specimens of dead organisms and categorize them by size, shape, weight, color, and other sensory-based data? [page 36] When man confronts Nature today he usually only studies what is lifeless. Even what is living in plants is only studied by applying to them the laws of substances as discovered in his laboratory. He omits to study growth; he neglects the life in his plants. Present-day science really studies plants as one who picks up a book and observes the forms of the letters, but does not read. Science, today, studies all things in this way. Indeed, if you open a book but cannot read, the forms must appear very puzzling. You cannot really understand why there is here a form like this: 'b', then 'a', then 'l', then 'd', i.e. bald. What are these forms doing side by side? That is, indeed, a riddle. The way of regarding things that I have put before you is really learning to read in the world and in man. By "learning to read" we come gradually near to the solution of our riddles. Doctors used to say salt was necessary and good for humans to have in their food. Then it was thought to be bad, then good, and now it's considered bad again. So we see all kinds of low-salt labels on food or low-sodium which is a euphemism for low-salt. There are even labels which specify "no sodium" on food items, such as water, which normally don't have salt in them! The amount of protein in a healthy diet has changed also. I wasn't aware of this until Steiner brought it to my attention. Obesity is a problem in the world today, especially in America, and yet the amount of protein the average person eats per day exceeds what is required, about twenty grams of protein a day for an already healthy person. I have added the dates so you can place the below quotation in time. In recent decades leading up to 2007, there were people who went on "High Protein diets" where they ate only protein-rich foods exclusively. One can imagine the results such a lifestyle for even a short length time had on their longevity. A healthy life calls for balancing the quantity and types of foods one consumes and not responding to the latest fads of materialistic thinkers, no matter what kind of degrees they have behind their names. [page 37] If we go back twenty years (1900), we find that experiments showed man to require at least one hundred and twenty grams of protein a day; otherwise he could not live. That was "science" twenty years ago. What is "science" today? Today (1924) twenty to fifty grams are sufficient. At that time it was "science" that one would become ill — under-nourished — if one did not get these one hundred and twenty grams of protein. Today science says it is injurious to one's health to take more than fifty grams at the most; one can get along quite well with twenty grams. If one takes more, putrefying substances form in the intestines and auto-intoxication, self-poisoning, is set up. Thus it is harmful to take more than fifty grams of protein. That is science today. Once one becomes accustomed to eating small amounts of food, one develops an instinct which is reliable as to what kinds and how much food one can eat. One simply turns away from food automatically which one’s body does not need and thereby one maintains a natural healthy state. No diet book or popular fad can provide us, via their materialistic calculations and arguments, with the wisdom that a healthy body already contains naturally if unimpeded by over-eating in any form. People who overeat are more susceptible to infections of every kind. [page 37, 38] Today we know that man gets the requisite amount of protein from any kind of diet. If he simply eats sufficient potatoes — he need not eat many — along with a little butter, he obtains the requisite amount of protein. Today it is scientifically certain that this is so. Moreover, it is a fact that a man who fills himself with one hundred and twenty grams of protein acquires a very uncertain appetite. If, on the other hand, he keeps to a diet which provides him with twenty grams of protein, and happens, once in a while, to take food with less, and which would therefore under-nourish him, he turns from it. His instinct in regard to food becomes reliable. Of course, there are still under-nourished people, but this has other causes and certainly does not come from a deficiency of protein. On the other hand, there are certainly numerous people suffering from auto-intoxication and many other things because they are over-fed with protein. I do not want to speak now of infectious diseases, but will just mention that people are most susceptible to so-called infection when they take one hundred and twenty grams of protein a day. If they only take twenty grams, they will only be infected with great difficulty. Scientists make calculations which can be quite precise and correct and yet very wrong. Steiner explains how the calculations of geologists can be very wrong by analogy to using calculations on the state of the human heart. They can estimate what the heart was like in a certain person three years ago. But using the same kind of calculation, one could extrapolate backwards three hundred years and determine what the man's heart would have been like only the man wouldn't have been alive. I heard about thirty years ago that if one has a tooth pulled that one's life expectancy is reduced by two years. My father had all his teeth pulled when he was thirty-nine and he is still alive at age 89! How could he have lost 64 years of his life and still lived as long as he has? Given the assumptions upon which calculations are made, they are accurate, but otherwise they are flat wrong. As I was reading this next passage, I received some family photos from a friend, Carol Hicks, which showed a wall-hanging of the Sun being held in the arms of and being kissed by the Moon. 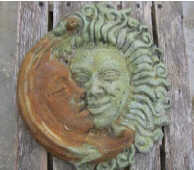 If the Moon points to our karmic past and the Sun to our future, then the sculpture would signify that our past is continually kissing our future. The sculpture represents artistically our destiny approaching us from our past ("our inner-moon existence") in our present and embracing our future (our "sun-element"). [page 44, 45] Everyone knows, or can, at least, know, that the sun not only wakens us every morning, calling us from darkness to light, but is the source of the forces of growth within us, including those of the soul. That which works in these soul-forces from out of the past is connected with the moon, but that which works within the present and which we shall only really acquire in the future through our own free choice, depends on the sun. The moon points to our past, the sun to the future. We look up to the two luminaries, that of the day and that of the night, and observe the relationship between them, for they send us the same light. Then we look into ourselves and observe all that is woven into our destiny through past experiences undergone as men; in this we see our inner moon-existence. And in all that continually approaches us in the present and determines our destiny, in all that works on from the present into the future we see the sun-element. We see how past and future are weaving together in human destiny. We stumble upon someone in mid-life and it seems to us many years later we had been on a path to meet this person and that all of our previous steps had been required for this meeting to take place. Naturally we traversed those steps without any consciousness of them leading up to this fateful meeting. It was that inner-moon in us leading us without our knowing why. [page 45] One may say, indeed, that people find their way to one another from the most distant places to meet about half-way through their lives. It is as if they had arranged all their ways with this end in view. Of course, they could not have done this consciously, for they had not seen one another before — or, at least, had not formed such a judgment of one another as would make their meeting significant. All these things take place in the unconscious. We travel paths leading to important turning points, or periods in our lives, and do so in deep unconsciousness. It is from these depths that — in the first place — destiny is woven. We wander along a path, but at some point, the "point of action", the Sun appears and our past kisses our future in the present. This happens with every meeting. Often we get a "love at first sight" flush of feeling, a wave of feeling from our future-to-be, which helps us to trigger the action necessary, but many times that flush of feeling is ignored because messages from the future are not recognized as a reality, up until now(2). [page 46] One may say, indeed, that people find their way to one another from the most distant places to meet about half-way through their lives. It is as if they had arranged all their ways with this end in view. Of course, they could not have done this consciously, for they had not seen one another before — or, at least, had not formed such a judgment of one another as would make their meeting significant. All these things take place in the unconscious. We travel paths leading to important turning points, or periods in our lives, and do so in deep unconsciousness. It is from these depths that — in the first place — destiny is woven. [page 48] . . . everyone can have direct, first-hand knowledge of these things. He can study his destiny with understanding. That peculiar, intimate, inner relationship in which another person speaks from within us — as it were — indicates ties of destiny from the past. If I feel that someone 'grips' me, not merely in my senses and intellect but inwardly, so that my will is engaged in the very way he grips me, he is connected with me by ties of destiny from the past. Such ties can be felt with a finer, more intimate sense. In this next passage we learn more about the "third man" inside of us, the human astral body. Since this "astral man" exists as a stream of air which one can hear with one's inner, musical ear, one can remember its nature by recalling the musical piece known as "The Third Man Theme." (3) the astral man who has his physical copy or image (Abbild) in all that constitutes the stream of inspired air. "Every word was once a live metaphor," Ralph Waldo Emerson wrote. Over time and repetitive usage, the live metaphor turns into a single word or, if a phrase, into a flattened cliché. This is the common evolution of language and we, in our abstract consciousness, lose the vibrant meaning the metaphor possessed in its origin. Steiner tells us in the next passage that language comes from the spiritual world through a process called inspiration, similar to the way we inhale air into our bodies, and for this reason the process of breathing itself is also called inspiration. We attend to our "third man" when we tune our inner hearing and allow ourselves "to be filled with inspirations from without." [page 68] Now language is really cleverer than men, for it comes to us from primeval worlds. There is a deep reason why breathing was once called inspiration. In general, the words of our language say much more than we, in our abstract consciousness, fed them to contain. Doesn't it seem strange that materialist science knows so little about how matter really works? They seem to know only about how matter interacts with matter as if matter were nothing more than a bowling alley of things bouncing against one and another! (3) When two people smile at each other or kiss each other, surely there is more of interest than the measurement of the widening of their oral apertures or the calculation of the forces exerted at the impact of their faces? [page 72] It is the tragedy of materialism that it knows nothing of matter — how matter actually works in the several domains of life. The remarkable thing about materialism is just its ignorance of matter. It knows nothing at all about the way matter works, for one does not learn this until one is able to attend to the spiritual that is active in matter and is represented by the forces. [page 75] What I am observing as the astral body of this person is not really present today, i.e. on the 2nd February 1924. If the person is twenty years of age, you must go backwards in time — let us say, to January 1904. You perceive that this astral body is really back there, and extends still further back into the unlimited. It has remained there and has not accompanied him through life. Here we have only a kind of appearance — a beam. It is like looking down an avenue; there, in the distance, are the last trees, very close together. Behind them is a source of light. You can have the radiance of the light here, but the source is behind — it need not move forward that its light may shine here. So, too, the astral body has remained behind, and only throws its beam into life. It has really remained in the spiritual world and has not come with us into the physical. In respect to our astral body we always remain before conception and birth, in the spiritual world. If we are twenty years old in 1924, it is as if we were still living spiritually before the year 1904 and, in respect to our astral body, had only stretched out a feeler. That, you will say, is a difficult conception. Well, so it is. [page 79] Man has his physical body through which he lives at each moment in the present physical earth. He has his etheric body through which he lives continually in a time-process extending back to a little before his birth, when he drew together this etheric body out of the general cosmic ether. He has his astral body through which his life extends over the whole period between his last death and his last descent to earth. And he has his ego through which he reaches back into his previous life on earth. Ancient human beings were able to perceive spiritual realities such as one’s past lives directly simply by looking at you. They could see your face in a previous incarnation appearing behind you and up slightly. People such as the Egyptians have left behind paintings which show a person’s head, and behind it appears a second countenance, less clearly painted, and behind it a third even less clear. Steiner says that we owe our moral impulses in this incarnation to the ego of our immediately previous incarnation. We feel obligated to act and cannot figure out why — it is the “man behind us” who binds us to act morally. [page 81] I have spoken of this riddle. I said, we feel ourselves morally determined by certain impulses given us in a purely spiritual way. We want to carry them out. But we cannot, to begin with, understand how that to which we feel ourselves morally bound shoots into our muscles . . . . Our moral impulses act indirectly, through the ego of our last incarnation. Here the connection between the moral and the physical is first found. It cannot be found by merely studying the present world of Nature and man as a section of it. [page 89] What man calls his ego in ordinary life is, of course, a mere thought. But it is the ego of man's past lives on earth that is active in him here. In the whole course of these processes, especially of the warmth-processes, you perceive the real ego, working from times long past. Between death and a new birth this ego has undergone an evolution in time; it now works in an entirely spiritual way. [page 89] Moreover, you now perceive that the ego has changed its field of action. It was active within, working upon the breath provided by the mere respiratory process; but now you perceive, from without, the further stages of the warmth-processes that the ego has elaborated from the respiratory processes. You behold the real, active ego of man, working from primeval times and organizing him. With our inspired knowledge we can witness directly the Ego and astral bodies leaving our physical and etheric bodies on the bed during sleep. [page 89] You now begin to know that the ego and astral body have actually left the physical and etheric bodies during sleep. They are outside, and now do and experience from without what they otherwise do and experience from within. In ordinary consciousness the ego and astral organizations are still too weak, too little evolved, to experience this consciously. "Inspiration" really only consists in inwardly organizing them so that they are able to perceive what is otherwise imperceptible. Thus we must actually say: Through "inspiration" we come to know the astral body of man, through "intuition", the ego. During sleep, intuition and inspiration are suppressed in the ego and astral body; when they are awakened, man, through them, beholds himself from without. Let us see what this really means. Recall how Steiner said that the past is always present in us. This seems not to be true for our waking consciousness, but it is true for our sleeping consciousness. It is commonly known that out-of-body experiences occur, but it is thought by materialists to be due to some aberration of personality, etc. How shocked they would be to know that it actually happens to them every time they fall asleep. Thankfully they are not aware of this happening nightly to them because their peace of mind would disrupted if they suddenly had to let go of their cherished beliefs that material world is all that exists. [page 90] Now, to sleep means nothing else than to lead back your consciousness, which is otherwise in the physical body, and to accompany it yourself. Sleep is really a return in time to what I described as past for ordinary consciousness, though nevertheless there. You see, if one really wants to understand the Spiritual, one must acquire different concepts from those one is accustomed to apply in ordinary life. One must actually realize that every sleep is a return to the regions traversed before birth — or, indeed, to former incarnations. During sleep one actually experiences, though without grasping it, what belongs to one's pre-earthly state and earlier incarnations. Our concept of time must undergo a complete change. If we ask where a man is when asleep, the reply must be: he is actually in his pre-earthly state, or has returned to his former lives on earth. When talking simply we say: he is 'outside' his body. The reality is as I have explained. It is this that manifests as the rhythmic alternation of waking and sleeping. All thoughts and perceptions make impressions in the etheric body, but the thought always occurs in the present moment, it is not stored. When a thought occurs which seems to have been stored, what we are experiencing is an act of memory being transformed into a thought. Thoughts are like the waves above a deep ocean inside of us. [page 92, 93] Between waking up and falling asleep we move about the world, receiving impressions from all sides. We only attend to a few, but they all attend to us. It is a rich world that lives in the depths of our being, but only some few fragments are received into our thoughts. This world is like a deep ocean confined within us. The mental presentations of memory surge up like single waves, but the ocean remains within. It has not been given us by the physical world, nor can the physical world take it away. When man sheds his physical body, this whole world is there, bound up with his etheric body. Upon this all his experiences have been impressed, and these man bears within him immediately after death. In a certain sense, they are 'rolled up' in him. It is from these rolled up or impressed memories within the human etheric body that the process of kamaloca proceeds. This is known from many people who have nearly drowned or had other near-death experiences: they view a moving tableau or diorama of their life to date. It is usually said, "My life passed before my eyes." In this next passage Steiner describes this process in some details that I have found nowhere else, so it is important to study it carefully and meditate upon it. [page 93] Now man's first experience, immediately after death, is of everything that has made its impression upon him. Not only the ordinary shreds of memory which arise during earthly consciousness, but his whole earthly life, with all that has 'impressed' him stands before him now. But he would have to remain in eternal contemplation of this earthly life of his if something else did not happen to his etheric body, something different from what happens to the physical body through the earth and its forces. The earthly elements take over the physical body and destroy it; the cosmic ether, working (as I told you) from the periphery, streams in and dispels in all directions what has been impressed upon the etheric body. Thus man's next experience is as follows: During earthly life many, many things have made their impression upon me. All this has entered my etheric body. I now survey it, but it becomes more and more indistinct. It is as if I were looking at a tree that had made a strong impression upon me during my life. At first I see it life-size, as when it made its impression upon me from physical space. But it now grows, becomes larger and more shadowy; it becomes larger and larger, gigantic but more and more shadowy. Now it is like that with a human being whom I have learnt to know in his physical form. Immediately after death I have him before me as he impressed himself upon my etheric body. He now increases in size, becomes more and more shadowy. Everything grows, becomes more and more shadowy until it fills the whole universe, becomes thereby quite shadowy, and completely disappears. This lasts some days. Everything has become gigantic and shadowy, thereby diminishing in intensity. Man sheds his second corpse; or, strictly speaking, the cosmos takes it from him. He is now in his ego and astral body. What had been impressed upon his etheric body is now within the cosmos; it has flowed out into the cosmos. We see the working of the universe behind the veils of our existence. The famous script called Desiderata has this wonderful phrase in it which seems resonate with everyone who hears it, even though few understand it, up until now. You are a child of the universe, no less than the trees & the stars; you have a right to be here. And whether or not it is clear to you, no doubt the universe is unfolding as it should. Perhaps this next passage of Steiner's lecture will illuminate us as to the reason for the deep feeling the passage arises in us. [page 94] We now stand in the universe and say to ourselves, as we consider, first of all, this experience with our etheric body: truly, we are not only here for ourselves; the universe has its own intentions in regard to us. It has put us here that its own content may pass through us and be received again in the form into which we can transmute it. As human beings we are not here for our own ends alone; in respect to our etheric body, for example, we are here for the universe. The universe needs us because, through us, it 'fulfils' itself — fills itself again and again with its own content. There is an interchange, not of substance but of thoughts between the universe and man. The universe gives its cosmic thoughts to our etheric body and receives then back again in a humanized condition. We are not here for ourselves alone; we are here for the sake of the universe. We complete our review of this book of Steiner's lectures with a caveat issued by Rudolf Steiner himself. He has said this many times in other lectures in various ways, but never as explicitly as he does in this lecture. He has reached the penultimate year of his life, so all the other times he said it, he was younger and one does find the precise words to communicate after long practice. Like a doctor of medicine may call his work a "practice", so also a lecturer or a writer may call his work a practice, because everything he writes or says something he has the advantage of having practiced writing or saying it many times before and this time will be his best effort. Words, Steiner clearly understands, are flattened live metaphors and they can only serve to communicate to those who will take the effort to convert the flat words into a living reality in themselves. Only that way can we, from the words of Rudolf Steiner, begin to experience directly the spiritual worlds within ourselves. [page 95] Theoretical Anthroposophy is a photograph of what Anthroposophy intends to be. It intends to be a living presence; it really wants to use words, concepts and ideas in order that something living may shine down from the spiritual world into the physical. Anthroposophy does not only want to impart knowledge; it seeks to awaken life. This it can do; though, of course, to feel life we must bring life to meet it. In the movie of about twenty years ago titled, “Ghost”, we witness as two evil protagonists die on screen and out of the shadows come dark spirit beings who drag the dead away screaming as if their very existence were threatened by the dark things. We will each come face to face with such spirits after death if we have in some way hindered the evolution of humankind. [page 129] On entering the world of spiritual beings, however, we do not merely meet the ideal judgment that we are of little worth in respect of any fault or disgraceful deed we have committed; we feel the gaze of these beings resting upon us as if it would annihilate our very being. In respect of all we have done that is valuable, the gaze of these beings falls upon us as if we first attained thereby our full reality as psycho-spiritual beings. Our reality depends upon our value. Should we have hindered the evolution that was intended in the spiritual world, it is as if darkness were robbing us of our very existence. If we have done something in accordance with the evolution of the spiritual world, and its effects continue, it is as if light were calling us to fresh spiritual life. We experience all I have described and enter the realm of spirit beings. This enhances our consciousness in the spiritual world and keeps us awake. Through all the demands made upon us there, we realize that we have won something in the universe in regard to our own reality. These lectures present in only 130 pages a deep look into the major points of Steiner's spiritual science, and even though it may be a reprise for some, there will be nuggets of mind-boggling concepts and details or rephrasing for all who read these lectures. The nuggets will be spiritual food to be ingested and digested over the coming years as one works oneself on the way to the light of the spiritual world. Footnote 1. Compare this to what William Blake wrote when he suggested that you learn "To see a world in a grain of sand, And a heaven in a wild flower, Hold infinity in the palm of your hand, And eternity in an hour." Footnote 2. These "flush of recognition" feelings constitute a process I call "Remember the Future" and have embodied the process in Matherne's Rule #36, where I elaborate on the process and give examples from my own life where it has worked for me and others I know. Footnote 3. This metaphor of a bowling alley as describing the work of material science comes from this fine book The Marriage of Sense and Thought — Imaginative Participation in Science by Stephen Edelglass etal, in which the authors describe how science can fruitfully wed its bowling alley roots of human senses with the imaginative participation of human thought. To Obtain your own Copy of this Reviewed Book, Click on SteinerBooks Logo below to Check if it's in publication.